This contest will take place November 10, 2018 and will feature an elite group of LCU applicants who will engage in a group discussion and individual interview as well as enjoy lunch, a question and answer session with current LCU students, and an optional campus tour. The winners will be determined based on a blend of academic, community/church service, and interview/group discussion responses. Scholarship applications are due by 9 a.m. October 15. To be considered, scholarship applicants must first have completed a LCU admissions application and be accepted in order to apply for the scholarship competition. The competition is only open to high school seniors and transfer students. Students can apply for admission at www.LincolnChristian.edu/apply. The two winners, as determined by the undergraduate enrollment staff along with recommendations from LCU faculty and staff involved in the event, will possess the qualities we most desire in our students: a serious approach to academic study as well as an embrace of LCU’s core mission to be a place that prepares its students to be successful Christian leaders in a transformational community of difference-makers. All prospective students who have been accepted to LCU are invited apply, but only 30 prospective students will be invited to the event on November. 10. Attendees will be chosen from those who seem to be a particularly great fit for LCU’s campus community, and whose time here as students would be mutually beneficial to the university and their own educational experience. The attendees who do not receive the full-tuition scholarship will receive a one-time $500 scholarship to be applied to their first semester’s bill. 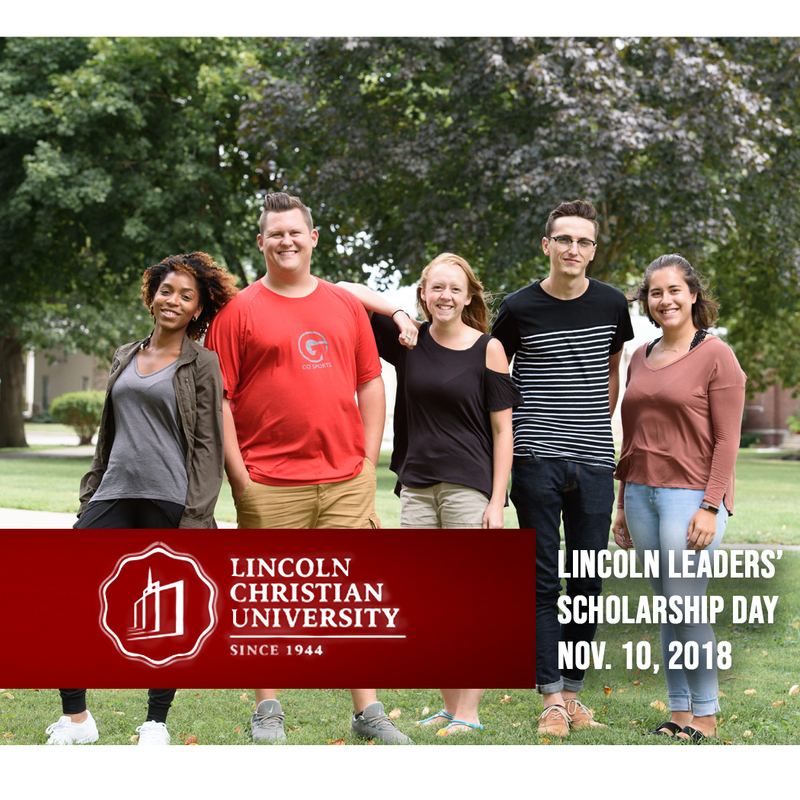 Interested students can apply HERE for the Fall 2018 Lincoln Leaders’ Scholarship Competition, or by contacting the LCU Enrollment Services office for a paper application. Scholarship applications can be faxed to (217) 732-4199 or mailed to Attn: Enrollment Services, Lincoln Christian University, 100 Campus View Drive, Lincoln, IL 62656. For questions about application status or how to complete the application requirements, please call (217) 732-3168 or email Enroll@LincolnChristian.edu. *Scholarship applies to 60 credit hour associate degree or 120 credit hour bachelor degree. Winners must maintain status as full-time students and live on campus at LCU. Winners must pay room and board.